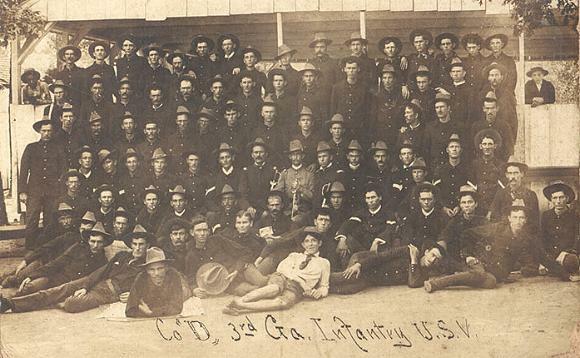 The 3rd Georgia Volunteer Infantry, Co. D.
Click here to view a photo of the 3rd Georgia Infantry, Company C, taken at the same location! The Third Georgia Regiment served stateside during the Spanish American War, but following the war, the unit served in Cuba as part of the occupation force. The 3rd Georgia Volunteer Infantry was organized after President William McKinley's second call for troops. On June 17, 1898, Colonel John S. Chandler was appointed as the unit's commander, however the unit was not mustered into service until August 24, 1898 at Griffin, Georgia. The war's fighting had ended on August 12, 1898 by armistice, though the war would officially continue until the signing of the Treaty of Paris on December 10. The Third Georgia's career as a military unit started too late for it to be actively involved in the conflict. Colonel Chandler's experience was that of commander of the Fifth Regiment of Georgia Infantry since 1893, and also as state judge advocate. The second in command was Lt. Col. R. L. Berner of Forsyth, Georgia. Forsyth had been a state senator, a member of the state House of Representatives and a candidate for governor. Berner's military experience was limited to his servce as a 2nd lieutenant in the Quitman Guards of the Second Regiment of Georgia Volunteers. Company C - Newnan, Coweta, Meriwether, Carroll, Ferrell and Paulding Counties (Capt. J. E. Powell). The unit was presented with a regimental flag by the state legislature and a stand of colors by the ladies of Atlanta. At the time of its mustering in, the unit consisted of firty-three officers and 1,243 enlisted men. With the end of the war on December 10, 1898, the need arose for occupation troops in the areas captured during the war. The 3rd Georgia was sent to Cuba, leaving the U.S. on January 14, 1899, arriving in Cuba four days later. The unit would remain in Cuba just over two months, leaving the island on March 25, 1899, and arriving back in the United States on March 29. The 3rd Georgia was mustered out on April 22, 1899 at Augusta, Georgia. At the time of its mustering out, the unit consisted of forty-six officers and 945 enlisted men. During its term of service, the unit lost one officer and twenty-four enlisted men to disease, and one enlisted man died as the result of an accident. In addition, two enlisted men were court-martialed, fifty enlisted men deserted, and twenty-two enlisted men were discharged on disability. Dorminey, J.E. (Edd) - Photo. Wood, Clyde - data on Frederick and Schubert Baumgartner of Rome, GA in the main page photo. Wright, General Marcus J., Wright's Official History of the Spanish American War. (Washington: War Records Office 1900) 593-595.